First take a native chicken, wash it well and dry it with paper towels. I wanted the skin nice and dry so the final product would possess a crisp skin, so I briefly used the Teen’s blowdryer to remove any moisture from the surface of the chicken. Then I simply stuffed it with baby batuans, some chopped onions and a little garlic, some salt and pepper. I added salt and pepper to the outside of the chicken and brushed it with olive oil and into an oven for some 55-65 minutes, depending on the size of your chicken. Let the bird rest for 10 minutes once it emerges from the oven and slice and serve. 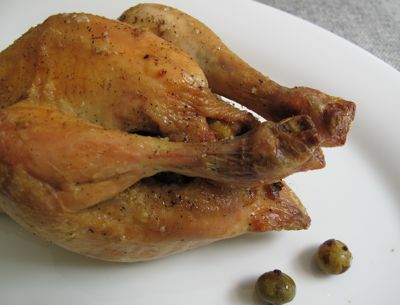 I thought it was very good, a nice variation on our standard lemon and herb roast chicken. But the batuan wasn’t strong enough. I suspect using mature fruit would yield better results, or perhaps cutting open a few of the baby batuans would have helped. 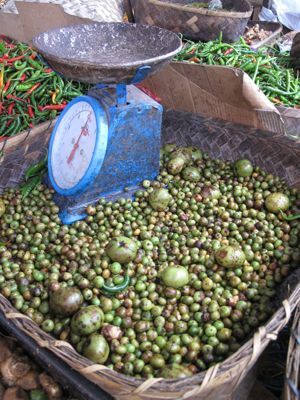 Overall, a good experiment, and something you may wish to try when you have an abundance of fresh batuan on your hands. And for those of you abroad, there is some bottled whole batuan and batuan puree on the market, see this post. Oh, and yes, the skin was NICE and CRISP. whatever the stuffing is, i just love roasted chicken especially with crispy skin. roasted some quarter chicken parts 2 days ago with thyme and rosemary herbs. for whole chicken i usually used lemon slices and shallots as stuffing. well, this is certainly a variation. but the problem is finding butuan here..nwei, the photos certainly has a crispy-crisping skin! yumm! I normally make compound butter and spread it between the skin and meat, stuff the bird with lemon and herbs, then I make it seat on a bed of rock salt and then roast. And yes, I also make them rest before we eat them!!!! Batwan is NOT a relative of mangosteen. It is the fruit of a very big tree. One can get batwan already bottled at ECJ Farms. This grows only in Negros and Iloilo. Its main use is for “aslum.” We even eat it raw. Wow! Batuan to stuff lechon manok? Cool. Lemme try that too! I have to look that up when I visit Iloilo.Would you know if they are available the whole year round? I find it amusing when I see comments that tell you you’re wrong but cannot support their statement with real data.hehehe..peace! heehee–many years back, we (MM n readers) have established the fact that Batuan belongs to the mangosteen family..i have long memory on MM’s posts. if i’m not at work, i could scroll back and tell you where..
Never heard of batuan but I loooove mangosteen. I so miss it over here. 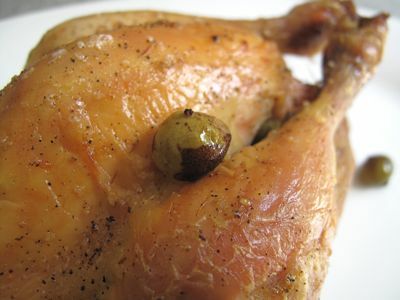 Love roasted chicken…just the thought of that crispy skin is making my mouth water. I think batuan is seasonal. Here in Leyte, I only find them in the market during certain times of the year. MM’s use of batuan for the roasted chicken is novel but I’m quite sure its tasty and delicious because its native chicken. Yes, yes batuan works well in chicken. I have the bottled ones which I believe I am one leg behind from fresh ones but want can I do beggars cannot be choosy. Fresh batuan still the best! I am a new galangal convert and galangal and batuan works together well. Even in tinola used both of them and you will rewarded with a hearty tasty tinola. I stuffed my roasting chicken in with sliced batuan, galangal, green onion, garlic and lemongrass and fill in the skin and meat with the same sliced herbs. It is the best roasted chicken I had which is not even comparable to your native chicken which I have been longing for. I used frozen chicken and who knows how long it has been kept in the ice. The galangal and batuan brought my frozen chicken back to great taste. Although I have lived with good cooks all my life and have not had much problems with food on the table, walking through the veggie section of Libertad market last Sunday with you, MF, PL and AJ was a whole new experience. I did wonder what you and MF would do to all those purchases. Reading on what you did with the batuan has satisfied part of my curiosity. Thanks for the lessons, MM. i’ve never seen baby batuans like that. interesting. I was in Negros a couple of years ago and my cousin introduced this to me. t was really very good. She placed it in KBL. I still remember that dish. When I roast my chicken, I pretty much do the same as Artisan C (sans salt bed). And my roast really comes out very good. As roast chicken is cheap here, I rarely do that now. But the best roast chicken I’ve tried was/were the ones sold on the roadside of the French territory we lived at for a year…tasty, moist, not fatty. thanks for the info and the tasty chicken pic. LOL @ the almost-kinda-semi fishpan post there MM. Cheers! k. ramos, HAHAHA. I actually burst out laughing when I read that comment. Fred, :). GJ, it was MY pleasure to be in your and AJ’s company for the market tour. We went a bit late, but had we been there at the height of the morning rush, we would have needed another vehicle to load our haul with us. GJ, more posts in the days ahead with the stuff we acquired in Bacolod. Thank you again. MM: when I was a little girl in 19 kopong kopong, my mom and dad would go to HK every now and then. My mom would ask me what I wanted as pasalubong. My sisters would go for shoes and clothes BUT I always went for those chicken wrapped in paper and the Hainanese ones. Now that I have grown (up and sideways…ahhahah! ), I cloned the Hainanese one as well as the parchment wrapped one. It is my next favorite to the Hainanese…no, make that my 3rd, favorite way of preparing chicken…tops on my book is the Brined one and roasted on the barbecue rotisserie…next is Hainanese and 3rd is this parchemnt wrapped one. …LOW FAT and tasty and really good! … I think my version is waaaay better than the Chinese delis. So, if you want to try it…make a paste first of garlicky seasoned salt and add 5 -spice powder. …I usually just use the tancha method. Then add some sesame oil and canola oil to make a ppaste. Then rub that inside the cavity and all over the skin. Let it sit overnight, Next day, stuff teh chicken with a small knob of ginger …whACK IT…some scallions bruised and tied in a knot, a few garlic crushed …put that inside the cavity. Now MC will put galangal, I know it!! !…Then take A WHOLE PARchment paper and put the chicken and wrap in a parcel. Sorry, Thelma…it serves me right for not bringing my glasses! Anyway… add the smoking hot oil to ginger-onion sauce just like the Hainaneses chicken dipping sauce. DO THIS IN THE SINK SO YOU WILL NOT BE SPLATTERED WITH THE HOT OIL!Then add some of the infused oil into the 5 spice seasoned salt thinned with a bit of the pan juices. Let it REST!!!!! Brush the chicken with the infused oil (5-spice) before chopping to serving pieces. The 5-spice is quite pungent so use it sparingly with the seasoned salt. Hay, naku….what is wrong with this computer?! ?…OK, it gets buttery soft. This is similar to the ones served as appy in Chinese banquet with marinated beef shank, sliced paper thin, pink shell scallops, etc. If you have any leftovers, turn it to DRUNKEN CHICKEN!…shred the chicken, then in a bowl, add some of the 5-spice dipping sauce, ssome of the pan juices, dry sherry or sake, pinch of sugar and add the shredded chicken. Let it sit there for a few hours. Serve with the marinated jellyfish. But if you are too lazy like I am to make the jellyfish sometimes, I just scoop teh drunken chicken in iceberg lettuce cups. SOOOOOOOOOO GOOD, Thelma, in this scorching hot weather. EAT IT COLD!!!! K.ramos, that was a good laugh…thing is, I use the blowdryer on the dog, hehehe. hi MM, have tried using libas or lubas (Spondias pinnata) as a souring agent in your dish? i heard this is good for fish and laing. We have a libas tree behind our house, and i’m looking for other recipes where i can use it. Ruth, when I was child in Leyte, we had a libas tree in the backyard and I recall eating tinola nga isda soured by libas fruits. I don’t know when it was added in the cooking process. I guess it was handled the same way that kamias is used as a souring agent in tinola. The same paper is interesting as it discusses libas, which ruth and moni have also mentioned above. Thank you for your very informative post! You have provided me with vital information on “Batuan” especially the scientific name. For your information, batuan abounds here in Romblon. This is one of the common “souring agents” especially for “sinigang” and “paksiw”. Actually I am contemplating on undertaking a research on the preparation of batuan in powder form just like those other souring agent available in the market today. Please furnish me with additiional information about the fruit if it is not too much for you. THANK YOU AND GOD BLESS! Flower Arrangements for PHP186.66 or USD3.89 each?! ?